Things are definitely slowing down on the Locost front. The shorter days, holidays, and weather are all having an impact. We're putting on a big track day at Thunderhill Raceway in two weeks, and that'll probably knock a whole week off the schedule. The weather has not been cooperating either, with the garage cold and damp and stuffed with cars that would ordinarily get pushed out into the driveway on a nice day. Okay, one car, but it's big and it really gets in the way. Okay it's not that big, it's a Miata, but still. We've managed to get some of the last few pieces welded to the chassis, including the curved rear fender supports and a few more tabs. We made the fender supports out of 1/8" steel strip and 16 gauge steel leftover from trimming the floor. We designed them to fit a 30-inch rear fender, which we don't have right now but shouldn't be hard to find. Of course a smaller fender would fit, but the edge of the fender has to match the curve of the fender support exactly, or else you're going to need to explain why it doesn't. We only have a couple of items left on the agenda before painting the frame. The big thing we're waiting for is the roll bar, which hasn't arrived yet and is not looking too promising for a pre-Christmas install. 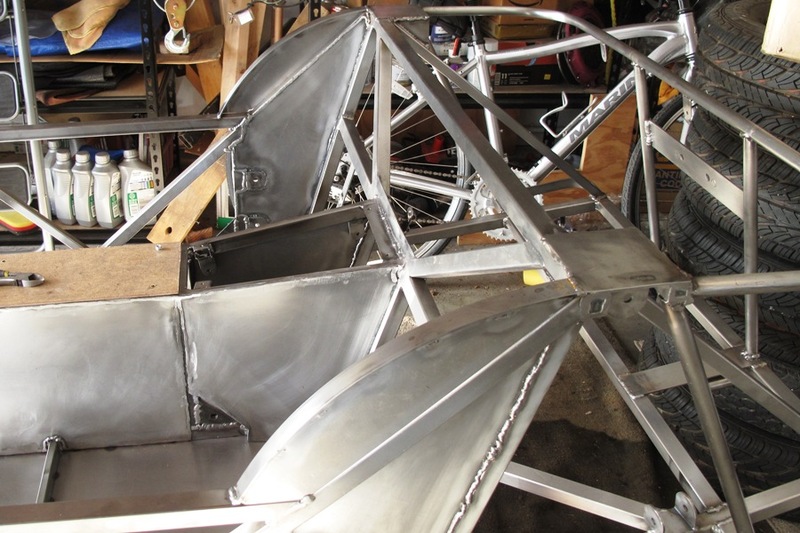 While we wait, we're extending the fuel tank mounts out 2-1/2", since we now know the exact size of the tank. 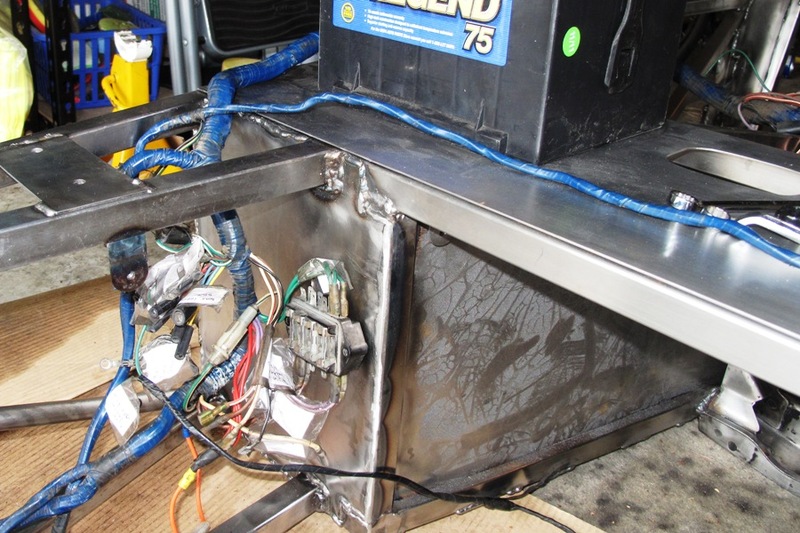 We're also welding blind nuts on to the mounts so we can bolt straps over the tank later on. 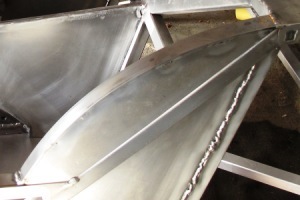 Another thing we plan to do is relocate the mounting tabs for the fiberglass nose cone. Not critical, but as long as we have the time, might as well make it perfect. Well, not perfect of course, but you know. Naturally, we still have tabs to weld. We could probably weld tabs 'til next spring and still not have enough. 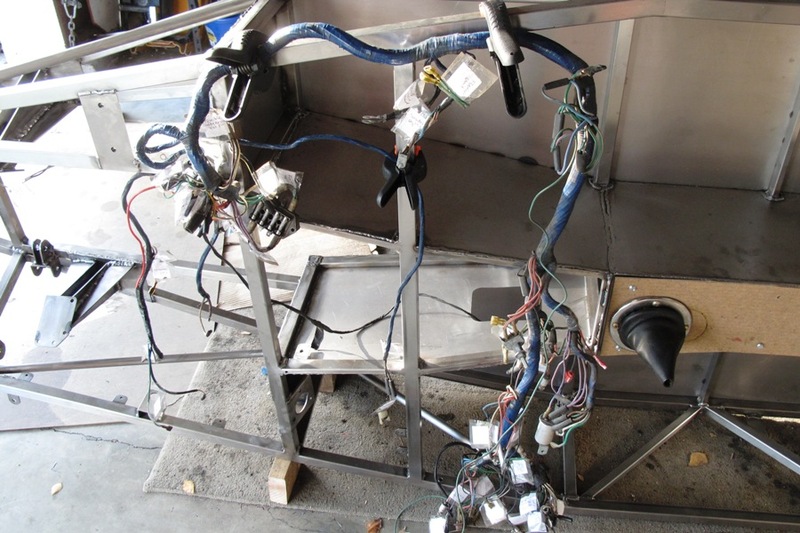 To make sure the new tabs would end up in the right place, we dragged out the forward half of the wiring harness and draped it over the car. 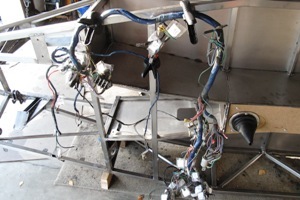 Unlike the rear harness, the forward harness was not too long. In fact, we had to be pretty efficient with the routing. Oddly, the one point on the harness that had to end up in the right place, and dictated the position of the rest of the harness, was the offside horn. 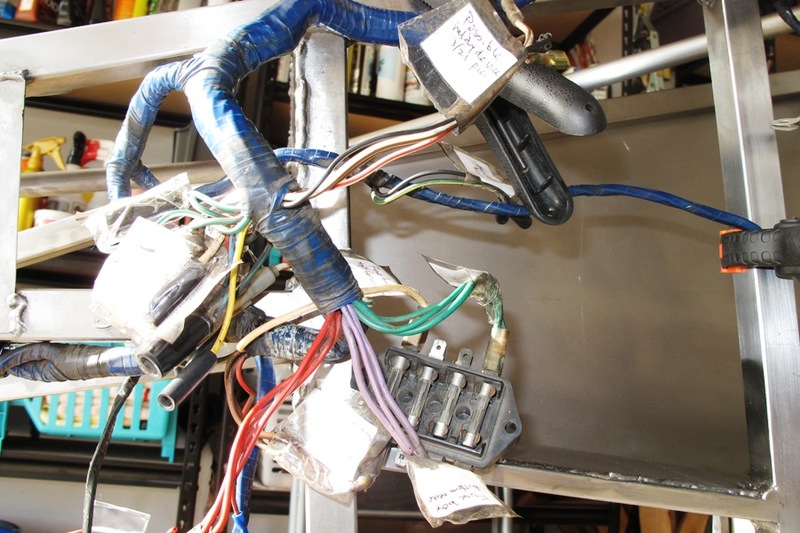 We attached two leads to the horn, then ran the harness back through the engine bay, where we were able to attach wires to the fuse box and set the fuse box on the edge of the engine bay shelf. Unfortunately this placed the fuse box right next to where the battery goes, which would look totally amateur. 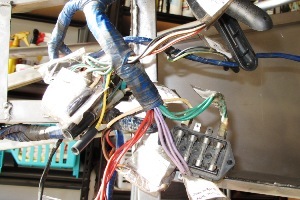 Directly behind the fuse box, and also right next to where the battery would go, was a huge tangle of wires that attach to the rear harness where it comes out of the transmission tunnel. So the whole thing looked like a big mess. We've had this idea since the beginning of our build that the fuse box belonged on the engine bay shelf. Clearly we were misguided about this. 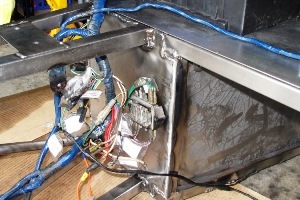 It turns out the fuse box actually belongs on the offside firewall. Yes, fuses will be difficult to access there, but come on, it's an M.G. The fuse box only has a couple of fuses. It's not that complicated. After we found the correct location for the fuse box, we were able to move that whole tangled mess of wires under the R and J tubes, where they're pretty much out of sight, so long as you don't look too hard. 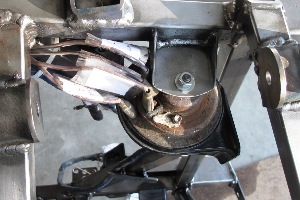 The harness branch for the coil, distributor, and alternator has just enough slack to reach those components, and the branches for the starter, reverse switch, and brake light switch are all sufficiently long. 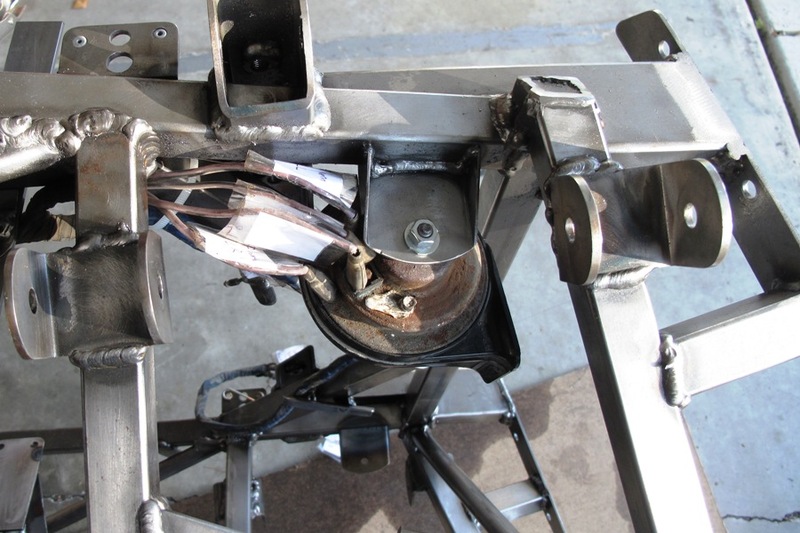 So the forward harness fits, and it turned out we only needed two additional tabs, although we were tempted to add tabs to the S and T tubes up front, where the harness crosses from the offside horn to the nearside horn. But those tubes don't have anything welded to them, which means you can run tie-wraps all the way around them, which makes tabs just so much excess weight. I'm not sure when we're going to have something to post next. We didn't do much work on the Locost last December, and this year is shaping up to be pretty much the same. If we don't receive the roll bar in the next week or so, we won't have much to do anyway except grinding and cleaning. Which will be kind of boring. Which is unfortunate, since it's really starting to feel like there's not a lot left to do before we have a running car. We need to find something else to keep us busy. Maybe we'll paint the wheels or something.